I got that tweet and I felt my whole body aching. It means that, today, one out of two Yemenis is hungry. It wasn't a shocking fact for me as much it was very upsetting. The pain was too much; I remembered poverty and I hate the fact that my people in Yemen are till spinning around the poverty circle. 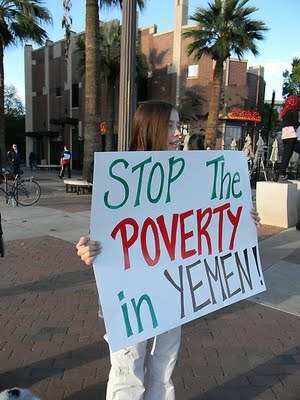 Yemen; the already poor country is getting poorer!! Then, I digged a bit to know more facts about this matter from the World Food Program's website. And I found that : on 18 October 2011, they published that, "With a population of 24 million, Yemen is situated at the Southwestern edge of the Arabian Peninsula. (..) According to a report by UN World Food Programme, ‘the Price of bread is 50% more than what it was at the beginning of the year’. Many Yemenis are spending 30 to 35% of their daily income on bread, leaving little for other necessities." And on 18 July 2011, they published "The World Food Programme, for example, was able to feed only half of 100,000 Yemeni girls targeted in the most recent round of a ration program to keep girls in school—because international donors had given only 30 percent of the funding needed for the program, said Gian Carlo Cirri, the WFP’s country director for Yemen." Then I was curious to know that how the already bad situation could get any worse! Then I found out that more than one year ago, they published "When we hear of Yemen in the news, it's mostly about terrorism. What's hidden are the hunger and suffering that afflict one in three Yemenis. The UN World Food Programme's hunger-relief mission in Yemen is dramatically low on funding. Supporting this petition is one way we can change this." Saleh's corrupted government used to swallow billions donated for Yemen. Where the hell did he spend it on!! Of course, to the army only and his gangs' pockets. The following post is an honest confession about my experience with poverty; something I share for the first time. I know poverty very well and I've tested the bitterness that comes along with it. As a child growing up in Yemen, I had to struggle a lot to survive and that was very painful. I'd not say that i have spent nights starving but I'd say that I'd always craved eggs, milk, fruit, tuna, chicken, nuts and .. it's a long list! I craved them all but I knew that I couldn't ask to have them. We couldn't afford them. Naturally, the result of that would be mal-nutrition which has been and it is still a common reality for many families in Yemen. There were many days when my breakfast consisted of tea and bread only. Lunch consisted of yogurt and bread only. Dinner would be beans and bread only or just tea and bread only. There were times when at school I made lots of efforts to hide the fact that I was poor. Recalling them now would only trigger my tears. Nevertheless, I made sure to pass those tough times gracefully. I got the best support from my mother. Her absolute devotion and greatness to raise two girls alone was extraordinary. She taught me how to be strong in the face of all obstacles. So, I studied hard; believing that education was my weapon against poverty. I made it and graduated from university. Then, I joined journalism and worked REALLY hard. I've always had in my mind that education + profession + hard work = bye bye poverty. Today, it can't be any more clearer to me that my mother is the greatest mother I could ever have. I owe her everything I'm today. I love her dearly!! Those were tough times but I made it! Nonetheless, close half of Yemen's population are hungry. It breaks my heart to read that Yemen; the already poor country, is getting poorer. I would probably get criticized about this post and, typically, get hate comments that I'm distorting Yemen's image. However, it's very important to know that the first step to solve a problem is to acknowledge it first. We must confess and let it out. Then, start thinking of solutions and do what it takes on the ground to stop the hunger epidemic; soon to sweep Yemen thoroughly. I'll leave it right here with those few words that I tweeted with earlier, "I'm 26 yrs old and I only saw one president; Saleh , and I saw nothing but misery under his rule."